Street clashes kill at least 30 people in Egypt's Port Said, after 21 soccer fans sentenced to death over a bloody stadium riot. Street clashes killed at least 30 people in Egypt's Port Said on Saturday, after 21 supporters of a local soccer club were sentenced to death over a bloody stadium riot in the canal city, AFP reports. The violence came a day after nine were killed in protests against President Mohammed Morsi on the second anniversary of Egypt's uprising against predecessor Hosni Mubarak, the worst crisis he has faced since taking power in June. Trouble erupted just minutes after a Cairo court handed down the sentences against fans of Port Said over the deaths of 74 people during post-match violence last February. Protesters attacked police stations and set tires alight and relatives of those who were sentenced clashed with security forces as they tried to storm the prison in Port Said where the defendants are being held, according to the AFP report. Some of the attackers used automatic weapons against police who responded with tear gas, witnesses said. The clashes left at least 30 people dead and 312 wounded, the health ministry said. The interior ministry said two policemen were among those killed. Medics told AFP all the fatalities were from gunfire. Crowds stormed two police stations as heavy shooting crackled through the city, where shops and businesses had closed, the report said. Ambulances ferried the injured to hospitals and mosques urged worshippers to donate blood. The army deployed troops to restore calm and protect vital public buildings, military sources and witnesses said. 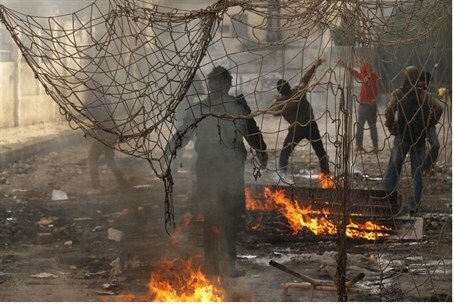 Clashes also erupted in the nearby canal city of Suez, where at least eight people were killed in fighting on Friday. Protesters attacked a police station, freeing 25 detainees and seizing weapons, security sources said. The opposition, meanwhile, threatened to boycott upcoming parliamentary polls if Morsi did not find a "comprehensive solution" to the unrest. The National Salvation Front, the main coalition of parties and movements opposing the ruling Islamists said it would "not participate" in the polls unless a "national salvation" government was formed. Egypt's national defense council, which is headed by Morsi, appealed for calm and called for a dialogue with "independent national figures" to agree on a mechanism for the polls, according to AFP. European Union foreign policy chief Catherine Ashton on Saturday expressed "great concern" over the violence, urging the authorities "to restore calm and order" and appealing for restraint on all sides.